The ‘next big thing’ in the beauty and cosmetic industry – argan oil has quickly become one of the most used oils within many cosmetic products. Often marketed as a wonder oil for skin and hair, argan oil has been in the spotlight for years. But where does it come from? And how is it made? Growing near the desert areas of the Mediterranean, argan trees (scientific name: Argania Spinosa) are known for their tiny leaves and deep crawling roots. Because of this, the tree is able to withstand wind or water loss for long periods of time. It grows a special kind of nut which can be extracted for its beneficial oil. Argan oil is harvested through hand-cracking argan nuts in between stones, an ancient technique that’s practiced by local Berber women located in Southwestern Morocco. Another way of harvesting argan nuts is by collecting Tamri goat droppings which contain undigested argan nuts. 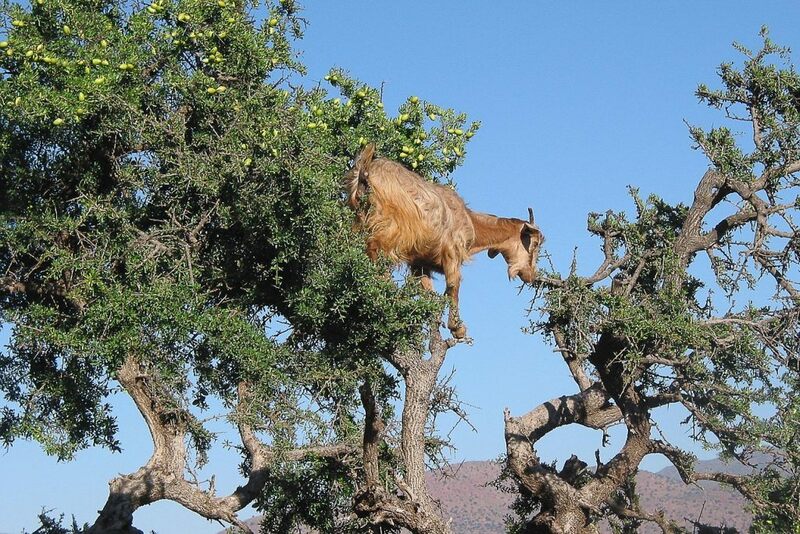 Tamri goats are local tree-climbing goats that eat argan fruits whenever they’re in season. This nut contains oil-rich kernels that can be roasted for culinary purposes or extracted for beauty serums. One of the world’s rarest and most expensive oils – argan oil is rich in antioxidants, Vitamin A and E, omega-6 and omega-3 fatty acids that offer lots of health and cosmetic benefits. In ancient times, Moroccan women have used this oil to keep their skin, hair, and body looking young. Shampoo – Most shampoos today contain harsh chemicals that are both damaging to your hair and scalp. When looking for a healthier and natural alternative, argan oil shampoos are the best choice. This shampoo is used to restore strength, softness, and bounce on your hair. It penetrates hair shafts and follicles, thereby improving the overall texture of your hair. It can also treat hair damaged by chemicals and colouring, restoring it to its healthy state. Conditioner – Using argan oil conditioner helps make your hair soft, shiny and silky. The oil hydrates your hair improving moisture and reducing dryness. It is also used to tame frizz and treat split ends. You can use argan oil as a leave-in conditioner to keep it moisturized throughout the day. Or as an overnight deep conditioning treatment to strengthen brittle and weak hair. Protection – argan oil protects hair from ultraviolet radiation emitted by the sun and other pollutants that cause your hair to become brittle and accumulate dirt. It cleanses the scalp, unblocking the pores to get rid of dandruff and help your hair get all the nutrition it needs for strong growth. Styling – You can use argan oil to safeguard your hair when using styling tools that emit heat. Before using a hair dryer or a curler, apply argan oil to your locks. It works on all hair types so whether you have curly or super straight hair, argan oil is good for you. Hair Growth – Suffering from thin hair or baldness? Argan oil promotes hair growth by improving cell regeneration on your scalp area. To use, simply massage the oil into your scalp once a week. Moisturizing Lotion – Argan oil hydrates and softens the skin leaving it with a healthy look and feel. Just a single drop of oil can be applied on your neck and face. It doesn’t feel greasy on the skin, nor does it leave any sticky residue like other lotions. Skin Toner – Get an all over body glow for your skin care routine. By using just 2-4 drops of argan oil mixed with other essential oils and water can make for a great skin toner. It can also help shrink pores and give a smooth look on your skin. Exfoliating Lotion – it can be used as an exfoliating mixture to remove dead skin cells and maintain a younger and fresher complexion. Relieve Dry Skin – it can treat people suffering from dry skin and skin conditions such as eczema and even psoriasis which leave skin with an itchy and flaky appearance. Argan oil can be used for all skin types, even for those with sensitive skin as it is 100% natural, and doesn’t have any ingredients that has allergenic properties. Facial Treatment for Acne – Argan oil contains ingredients that help retain moisture which makes it a good facial oil. Since it regulates the production of sebum and reduces skin inflammation, it removes facial acne and cures breakouts. The Vitamin E helps cells grow therefore fading acne scars and damaged cells. Makeup Remover – Use argan oil for an effective makeup remover. Unlike other oils, argan oil doesn’t hurt if it comes in direct contact with eyes. Anti-Ageing – Aside from helping remove dirt and excess oil, argan oil helps reduce the signs of ageing. With its powerful triterpenoids, it eliminates age spots and stimulates the renewal of skin cells smoothing lines and wrinkles. Nail Coat– Use argan oil to make your nails strong and healthy. You can use the oil before you polish your nails as it will help condition the cuticle and prevent painful hangnails. Sunblock – Protect your skin, hair, and nails from the damaging UV rays of the sun. Prolonged sun exposure can cause skin cancer and speed up the ageing process. Stretch Marks – Use argan oil after a bath or shower in areas where you have stretch marks. Argan oil will absorb and protect the elasticity of your skin. Abrasions – Heal your cuts, scratch, or scrapes with argan oil. Argan oil stimulates cell growth helping cure any skin-damaging injury. Razor Bumps – Use argan oil to soothe your razor bumps and burns. After shaving, massage a few drops of argan oil on the affected area and see the marks reduce in a few days. How do you know if your argan oil is pure? Fake argan oils are all over the market. Since the popularity of this wonder oil, many fraudsters are tricking people into buying bottles containing fake argan oil. It has a deliciously fragrant smell. It has a rich nutty smell like that of popcorn. Once it is applied to your skin, the odour disappears after a few minutes. If it smells foul, or smells of nothing at all, be suspicious, it could be a fake or rancid. It doesn’t come cheap. Producing the oil is hard work in itself. It comes with an expiration date. Unlike other oils which you can keep for several years, argan oil only has a two-year long shelf life. It comes in dark coloured opaque bottles in blue or amber colour. They are not sold in plastic containers. It is light golden yellow in colour. It’s smooth but not slimy. When applied to the skin, it should have a soothing effect and disappears after a few minutes. I bought this for my hair since I have split-ends and suffering from extreme hair dryness. I have really long hair and it requires a lot of effort to maintain. I wasn’t really a fan of oils until I started using this product. After just a week of using, my split ends have significantly reduced. And my hair is looking healthy and bouncy. I also like that it doesn’t leave any residue on my pillows like those other cheap oils. This oil works great as a facial treatment too. I tried it on my blackheads and after three days, they disappeared. The last oil I bought gave me the rash when I applied it on my skin. This oil has a very soothing feel when applied on the skin. Take note that this oil should be used lightly. I recommend not to re-apply, just one application will do for the day. The packaging is superb. I like that the oil dropper came with exact measurements helping me calculate how much I should use for the day. There was a little leak in the packaging, thankfully, only a few drops were wasted. I have been using this oil for a few months, and it’s my favourite. T his one has a really great smell compared to some others on the market. This one is much more fragrant. I’ve been using this as replacement for my conditioner and it works better than almost all conditioners I’ve used before. It feels really good on the scalp, but I only use it three times a week, otherwise it gets too oily. Now, I can’t live without it. Whenever I’m going out and have to style my hair, I apply this before using my hairdryer and it works wonders. My hair is more manageable and bouncy all day. It doesn’t have that greasy feel which makes you think all the dirt is sticking on your scalp, plus it makes it so smooth I can easily comb my hair using my hands. I ordered another for my friend who has curly hair and she liked it. Her hair had gone from frizzy to soft in just a few weeks. It’s almost a miracle oil when you think about how cheap it is compared to other Argan Oil brands. Lovely product. This arrived promptly and I was happy that it was securely packaged (no leaks or damage). The smell is amazing, it doesn’t have that strong smell of chemical or manure. It smells more like nut and perfume combined. This is one of the best hair serums I’ve used, this left my hair moisturised all day. It done wonders for my split ends too. Long hair can be a handful to manage, but thanks to this I am now able to pull off different kinds of hairstyles without worry. I was very impressed with how powerful just a few drops were. I have long hair so I use 4-5 drops of oil, this is more than enough to keep my hair oiled, smooth, and frizz-free all day. It’s a really thick serum so I advise not to put so much on as it will make your hair extremely greasy. The only con is it contains silicon and it isn’t really pure Argan Oil. But if you want a light serum which is equally effective (without the strong smell) this is by far the best choice. Although it’s expensive for a shampoo I totally recommend it if you want your hair to be super healthy. I think the best part of this argan shampoo is it cleanses the scalp very well. Previously, when I hadn’t washed my hair for more than a day, it used to feel itchy. Now it’s as fresh as when I just got out of the shower. I’ve used this every day exclusively for around 3 months now. I’ve replaced my shampoo and conditioner, and don’t plan to go back. I like that it makes my hair both smooth and clean. I feel more confident to wear my hair down and stop putting it up in a ponytail.